Lose of muscle mass (sarcopenia) is a problem that humans other primates and rodents suffer as a result of aging. CR has long been known to attenuate this muscle loss, including in CR primates . But on the other hand, CR animals and humans typically enter old age with less muscle to start with, so excessive muscle loss is still an issue for CR practitioners to be concerned about. Particularly at the age of 28 months, differences in muscle mass between the two intervention groups are relatively small, specifically when compared with the large difference present in body weight at all time points. In contrast to mice that have received the control diet, in the caloric-restricted group, no age-related decline in muscle mass was observed, which could be interpreted as protecting against sarcopenia. Absolute muscle masses were approximately similar in both groups at 28 months of age as were grip strength measurements. But perhaps the most interesting thing about the study is the author's discussion of why they think muscle mass may have been preserved. They talk about a bunch of biochemical and gene expression differences between aged CR and control mice that might have contributed to reduced sarcopenia in the CR group. But they also focus a lot on the role of activity (e.g. exercise) and its timing relative to eating in preserving muscle mass. 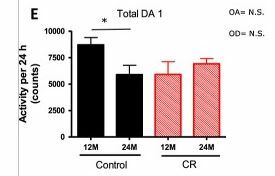 Maintaining a high level of activity likely helped the CR mice maintain their lean muscle mass (and strength) while the controls lost their muscles and strength. So this suggests the ability to remain active into old age as a result of staying lean and healthy on CR can help us maintain muscle mass relative to people eating a crappy, high caloric diet. The authors go on to hypothesize that increased exercise in the old CR group relative to the old controls may not be the only behavioral contributor to muscle preservation. They suggest that timing and intensity of the exercise may play a role as well. As is apparent in this graph of the timing of daily activity in young control, old control, and old CR mice, the old CR mice had a burst of high intensity exercise in the 2 hours prior to feeding, while the other two groups had exercise spread throughout the day (with the old controls having much less activity than the other two groups). Mice on a CR diet have more hunger and therefore show an increased [Food Anticipatory Activity]. This behaviour stays for the rest of their life if CR maintains. This activity is different from normal daily activity in a way that it is more intense: more running and climbing. The animals compensate for the activity [by being less active] during the rest of the day, which might result in a decreased total daily activity. Furthermore, it is hypothesized that the increase in activity just before the meal is provided, increases the insulin sensitivity of the body and assumedly of the muscle. A lower total provided load of carbs and fat due to the CR can further contribute to an improved insulin sensitivity. Next to that triggers the bout of activity an anabolic response of the skeletal muscles involved in this activity. We moreover speculate that the increased insulin sensitivity combined with the activity-induced anabolic response lower the threshold needed for protein synthesis and therefore make maintenance of muscle protein possible. Control animals showed an age-dependent sarcopenia, while caloric-restricted animals showed muscle mass and strength maintenance during lifespan. An adequate amount of protein provided as a bolus, preferably in combination with exercise, is currently recommended for sarcopenic elderly and COPD patients. These recommendations are designed to promote net muscle accretion. Our results indicate that mice on a 70 E% caloric-restriction diet show habitual changes that come close to these recommendations and therefore indicate that CR should be considered as a lifestyle and not simply a diet intervention. In short, these researchers suggest that pre-meal exercise combined with lifelong CR may be especially beneficial for muscle preservation as the body ages. sarcopenia in caloric-restricted ageing mice. musculus tibialis was used for real-time quantitative PCR analysis. better climbers and showed more climbing behaviours. J Gerontol A Biol Sci Med Sci. 2008 Jun;63(6):556-9. 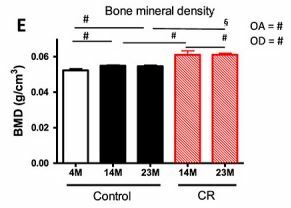 Attenuation of sarcopenia by dietary restriction in rhesus monkeys. 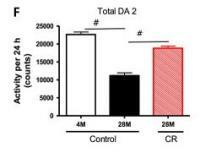 Colman RJ(1), Beasley TM, Allison DB, Weindruch R.
adult-onset DR can attenuate sarcopenia in a nonhuman primate model.